You might not know this, but Northern New Jersey is arguably the hot dog capital of the Free World. Rutt's Hut is one of the more well-known Jersey hot dog joints after being featured on several food shows over the past few years. Their dogs are deep-fried, causing the casing to "rip" open. Hence the name: Rippers. The Condiment Bible loves hot dogs almost as much as we love condiments...almost. 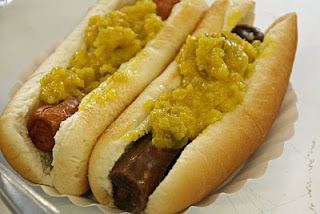 Our favorite thing about Rutt's Hut is the AMAZING homemade relish (see pic). This sweet bright yellow sauce is some heathen concoction of cabbage, onions, pickles, carrots and love. It's free for scooping when you eat in, but RH also sells relish pints and quarts for $3.50 and $7.00. If you're ever on Rt-21 (perhaps visiting lovely Paterson), stop at Rutt's Hut. You won't be disappointed.